David called me about building a stained glass window insert for the front door of his Craftsman style home outside Atlanta. 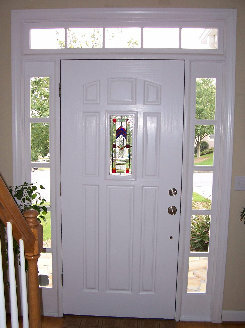 He had a standard home center front door with clear glass but wanted to add a colorful "mission style" glass panel that would be in character with the house and provide a little more privacy. He sent me a picture of a Frank Lloyd Wright style design he liked, and with some scaling down and re-drawing, we came up with a unique design. David's Door Panel measures 7 1/2" x 18 1/2" contains 58 pieces of glass and was completed in July of 2007.